For When You Want Something Chocolate-y And Autumnal, These Brownies Deliver!! Chocolate is a year-round staple for us and, as any true choco-holic knows, it goes perfectly with just about anything you pair it up with. 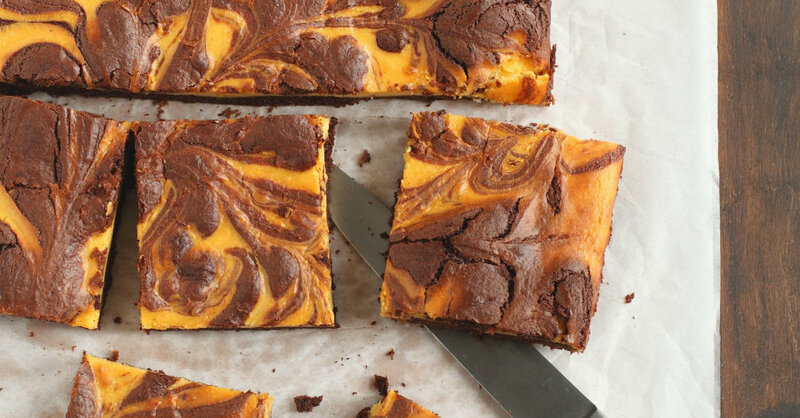 Once it gets closer to the time of year when it’s acceptable to eat pumpkin (and it’s absolutely everywhere), we like to try out new combinations and just whipped up a batch of these fudgy, chocolate pumpkin swirl brownies…they were amazing! If you’re at first skeptical of these flavor union, let us reassure you: these brownies are rich and full of flavor, and you’ll wonder why you never teamed chocolate and pumpkin up before! Taste them and see what all the fuss is about! Preheat oven to 350º and lightly grease an 8 or 9-inch square baking dish with butter or non-stick spray. In a large bowl or mixer, beat together pumpkin puree, cream cheese, sugar and egg until combined. Add cinnamon, nutmeg and allspice and stir until combined. In a separate bowl, prepare brownie mix according to packaging directions and stir in instant coffee granules. Pour 3/4 brownie batter into greased baking dish and then cover evenly with pumpkin mixture. Pour remaining brownie batter over the layer of pumpkin and drag a knife through the mixture to create marbled pattern. Note: only drag a few lines with the knife; too many and your pumpkin and chocolate will just look muddy. Place baking dish in oven and bake for 40-50 minutes, or until toothpick inserted in center comes out mostly clean. Remove brownies from oven and let cool 15 minutes before cutting into squares.